This volume is the beginning of a new arc, and one that goes beyond the scope of season 3 of the anime. If you’re a fan of the anime and want to get into the manga but don’t want to read about events you’ve already seen volume 14 or volume 15 are good places to start. Midoriya has just begun his internship and is going on his first patrol with upperclassmen Mirio when they encounter the very villain Sir Nighteye has been investigating – Overhaul. With him is a young girl who clings to Deku, clearly afraid. But they can’t save Eri, not there. Soon other hero agencies are dragged into the trouble and raid is planned. Now, I read this series weekly in Shonen Jump, and I have to admit that I appreciated these chapters more when reading them in quick succession. It was easier to see the links between various occurrences, and I think, overall, I just enjoyed it more. 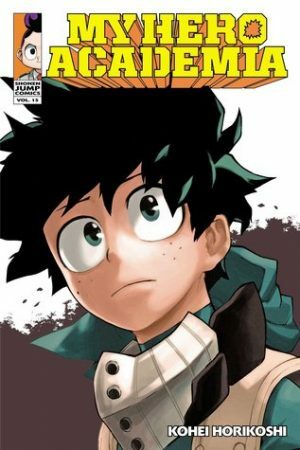 Some interesting themes are touched on in volume 14, and we get more page time with internships other than Midoriya’s. Uraraka and Tsuyu are interning with the same hero, and we see just a little of them their internship, using their powers together to take down two villains with gigantification quirks. We see much more of Kirishima’s internship with Fat Gum. While patrolling they too come across a group of villains. This chapter was fascinating, not only because we get a great fight scene, see Kirishima’s debut as a pro-hero, and get some plot relevant development, but also because we see small time villains and Kirishima trying to de-escalate the situation just by talking to them. How exactly one should approach hero work and how pro-heroes should go after villains and large villain operations in a post-All Might world are both talked about extensively in this volume. There is very real discussion on immediate action versus precaution and careful planning in hero operations. This is most visible in Mirio and Midoriya’s reactions to finding Eri and Overhaul, one wanting to act more as Sir Nighteye normally does and the other with All Might’s possibly too hasty action. The pro heroes who come together to form a plan to capture Overhaul also argue back and forth on what the two boys should have done, what they should do moving forward, and if immediate action or careful planning and execution are how they should be operating. One was forward isn’t ‘right’ and the other isn’t ‘wrong’. There are good arguments both sides have. The immediate gut reactions and launching in action without a plan can be useful – the element of surprise can be very beneficial. Yet, the well thought out plans and waiting until the upper hand is held has also proven very effective. There is also a lot of emotion here. We are reminded, I think, of just how young these heroes in training are. They’re worried about the upcoming mission. There’s fear and trepidation going into the mission, something that Midoriya, Kirishima, Uraraka, and Tsuyu’s classmates pick up on. We see Aizawa change too. Despite how he acted in the beginning of the school year and how tough he is on his students, he sits with the internship bunch and has a rather heartfelt conversation with them about the proposed raid, their roles in the events leading up to it, and their options going forward into the raid itself. In a volume so packed with build up to a major confrontation, there is certainly a lot of heart here. Emotions are worn on sleeves, and some wonderful scenes are borne of this. My Hero Academia Vol. 15 by Kohei Horikoshi is one filled with equal parts action and quiet, heartfelt moments. Built up to the next volume is high, and I can’t wait to get my hands on volume 15. I highly recommend both My Hero Academia Vol. 15 and the series as a whole.